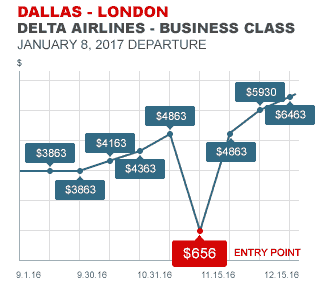 If you’re a frequent international business traveler, you know all too well how fares work. Unfortunately, you have probably never been able to make them work for you. You purchase tickets a few weeks or even a few days before departure only to find that great fare you found a month ago has more than doubled. When you try to purchase early, your plans inevitably change and you end up paying what seems to be a King’s ransom plus a penalty. To make matters worse, your initial ticket was non-refundable. Even though there may be lower fares with other airlines, you are locked in to the initial carrier as they have your money. Passport Premiere connects international business travelers to distressed business class inventory. We provide our members lower price points compared with fares available in the open market for purchases made less than 30 days from the travel date. Simultaneously, we aid the carrier in distributing seats that may have otherwise gone unsold. For example, business class travel between the West Coast and Frankfurt purchased 50 days or more in advance typically carries BUY IT NOW pricing of $4,400 + taxes. The same ticket purchased less than 14 days from departure sells for nearly $10,000. If the carrier is unable to find enough travelers to pay elevated fare levels, seats will likely go unsold. As previously discussed, unsold seats are worthless after a flight departs. When there are unsold seats, Premiere members benefit from having pricing rolled back to what would have been paid had the member completed their purchase 30 days or more from the travel date. This feature provides business travelers with maximum flexibility allowing them to confirm travel much closer to the departure date without being penalized by escalating fare levels. Passport Premiere also connects business travelers to over 6 million contract fare combinations in business and first class from North America. Contract fares may be higher than fares secured through Fare Monitor, but provide our business audience the optimal combination of value added pricing with flexibility. It's your move, Join Now!